The BMW Platinum Visa Card is a travel rewards card that comes at a price: a $50 annual fee. The BMW Visa was designed for loyal BMW customers who want to earn rewards toward a new lease, loan or service. This Platinum Visa card is limited to consumers with excellent credit (700+) and as a result, comes with a low annual percentage rate: 7.24 to 10.24 percent on purchases and balance transfers. Of course, the penalty APR jumps quickly up to 27.24 percent. Optional travel rewards program ($50 annual fee). One point for every two dollars on all purchases. Double points on gasoline purchases. One point per dollar for travel rewards (requires $50 annual fee). BMW has a reputation for building some of the best-engineered cars in the world. But that status doesn't extend to its loyalty credit card. 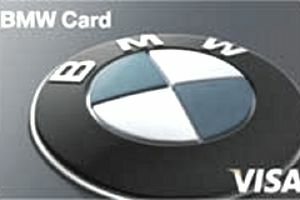 The rewards package on the BMW Platinum Visa Card is less than high-powered. You earn one point for every two dollars on purchases and double points on gasoline purchases. Points work out to a penny apiece, so that means you earn only 0.5 percent on your everyday purchases, not counting gas. That's about half of what you get on many other rewards cards. Points can be redeemed for a variety of items at BMW. You can get up to $5,000 back on a lease or loan from BMW Financial Services: 10,000 points are worth $100. You can use the points to add miles to your BMW lease - 1,000 miles for 20,000 points - or pay for excess wear and use charges. You can use your points to pay for service, parts and accessories at BMW dealerships. You can also use them to buy "BMW Lifestyle Merchandise." There is also an optional travel rewards program where you earn a point for every dollar you spend, or double the amount you earn with the regular program. However, this program carries a $50 annual fee. There's no annual limit on how many rewards points you can earn. Probably the most attractive aspect of the card is the APR: just 7.24 to 10.24 percent on purchases and balance transfers. That means you'll have to have exceptional credit to get it. If you prefer other brands of automobile and are interested in earning points toward a future vehicle purchase, check out the GM Flexible Earnings Card, the new Chrysler MasterCard, or the Toyota Rewards Visa. The Lexus Pursuits Visa also has an optional travel rewards program that lets you redeem points for airline tickets, hotel stays, car rentals, spas and cruises. There is a $60 annual for that program. While the BMW card pays double points on gasoline purchases, there are better ways to earn rewards on gas purchases. Check out our list of the Five Best Gas Cards. Credit card pricing, terms, and rewards are subject to change. Check the card issuer's website for the latest credit card deals. Is the High Price of a Credit One Bank Visa Platinum Card Worth It?